(Bloomberg) -- Markets from Sao Paulo to Tokyo are getting swept up in a downdraft spurred by questions about whether global growth is deteriorating faster than previously thought. As bond yields in Australia and New Zealand plumbed all-time lows in Monday trading, Asian stocks are heading for the biggest slide of 2019 and measures of market volatility are surging, albeit off low levels. At the heart of the moves is an acknowledgment that central banks and governments are struggling in their bids to prop up the expansion in the global economy. The tumble in equity markets began in earnest on Friday, as the S&P 500 Index sank 1.9 percent. 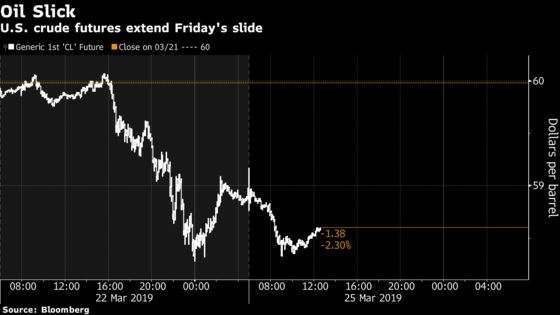 MSCI’s gauge of Asia-Pacific shares was down about 2 percent as of 1:20 p.m. Monday in Hong Kong, set for the largest drop since October. The benchmark has erased its gains for the month. Expectations for further swings in stock prices are soaring. 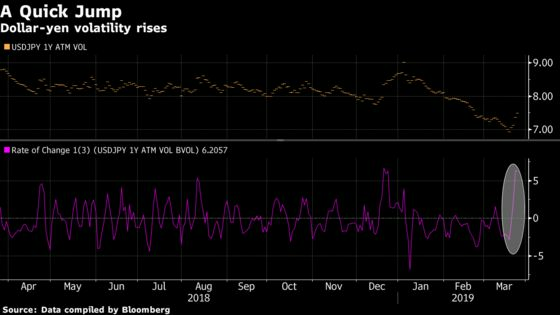 The Nikkei Stock Average Volatility Index jumped as much as 31 percent, the most since October, and the equivalent gauge for Hong Kong’s Hang Seng Index climbed 11 percent, though the low starting point highlights how placid things had become prior to Friday. 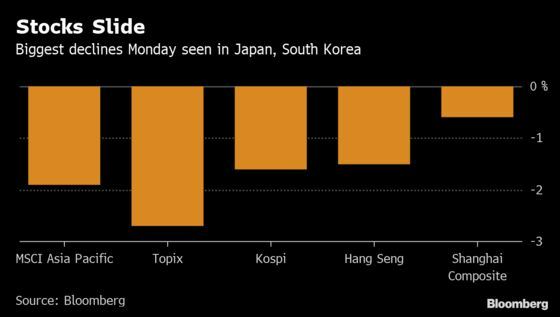 Volatility also surged the most this year in South Korea. 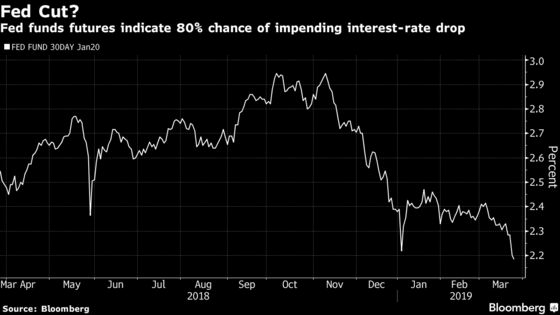 Fixed-income markets, which for weeks have highlighted investor concerns on the growth outlook, are showing there is little sign of worry abating. 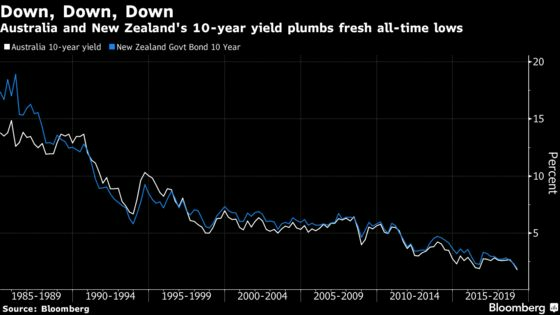 Australia’s 10-year bond yield sank below 1.8 percent for the first time, the latest example of a global move lower in long-term rates. There’s also been a notable change in trader expectations that a U.S. interest rate cut is on the not-too-distant horizon. Money markets show an 80 percent chance that the Federal Reserve will lower interest rates this year. Just last week that was less than 50 percent. Jitters over the health of the U.S. economy are putting pressure on crude prices as well. Crude futures extended losses Monday, joining the sell-off in other assets, after reaching a four-month high on Thursday. Global growth concerns are also having an impact on foreign-exchange markets. Among major currencies, the traditional haven Japanese yen is leading gains, while emerging markets including South Korea, Taiwan and Mexico are among the biggest losers. Another haven in gold, meanwhile, is also catching a bid. 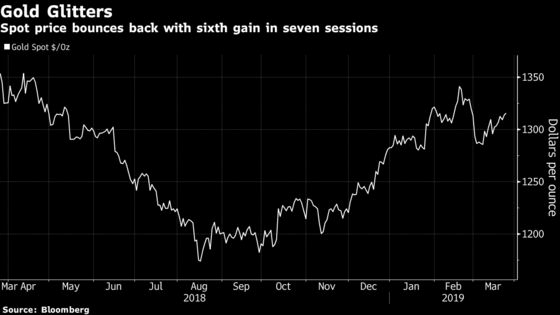 The spot price for the yellow metal is up in six of the past seven sessions, headed for the highest close in a month after rebounding from a January low earlier in March.